As well as being the 20th anniversary of FSI, 2007 also represents a change in its leadership. Marie-Christine Prin, whose hard work, efficiency, and charm had built up FSI to its current success, has passed the reins to Michel Plante, an industry veteran with an impressive background in audio at the technical as well as the sales/marketing level. The transition in leadership appears to have been seamless, a fact that Michel credits largely to the work of Céline Roy, who was Marie-Christine Prin's second-in-command, and who has stayed on with FSI. 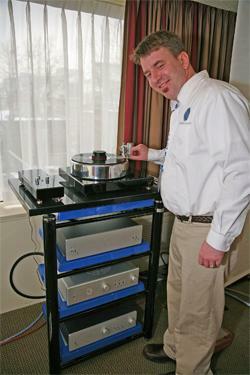 Michel Plante has ambitious plans to expand the mandate of FSI, making it appeal more to the trade as well as consumers, and finding more ways to attract young people to the audiophile hobby. His rationale for including gaming in FSI is that young people with no current interest in audio may come to check out the latest in games, but in the process of attending FSI would be exposed to some high-quality audio as well, and come to appreciate what it has to offer. Listening to Michel Plante talk about his plans, it's impossible not to be impressed by his commitment and enthusiasm. He's pictured here with one of the lovely FSI hostesses, Virginie Fisette. Readers with really long memories may recall the ESS Heil speakers, which had a tweeter whose working principle was described in ads as being like squeezing a cherry pit. Oskar Heil was undoubtedly a gifted inventor, and the Heil "Air Motion Transformer" principle is gathering new adherents. Elsewhere in this show report blog, I discuss the products from Adam Professional Audio, whose Accelerated Ribbon Technology is a variant of the Air Motion Transformer principle. Speakers from the Chinese company, Mark & Daniel, fall in the same category. They call their drivers "Directly Responding Emitter by Air Motion Structure" (DREAMS). 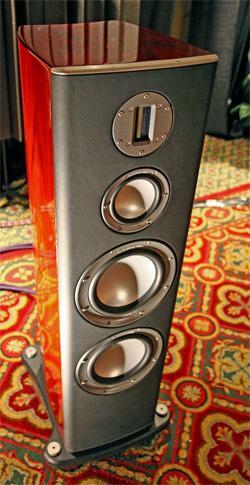 The pair of Mark & Daniel Aragon Monitors (CN$5500), mounted on Aragon stands ($1900), which act as bass extenders. 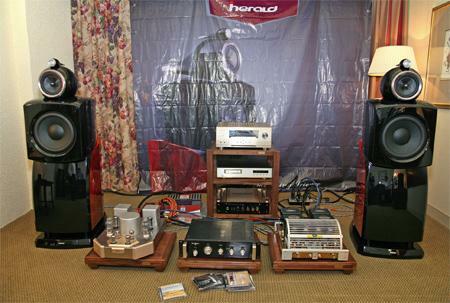 They sounded quite good, driven by the new Audio Oasis AMP-D1 amplifier (100Wpc, class-D, Made in Canada, CN$1495). I have to admit that Monitor Audio has been one of those companies whose products I've just taken for granted. I went into the Monitor Audio room at FSI more-or-less from a sense of duty, but was almost literally stopped in my tracks. What's this? A new speaker that doesn't have the conservative look that I associate with Monitor Audio, and sound that was arrestingly lifelike. The speaker was the Platinum 300 ($8995—all prices in this report per pair), the top of the Platinum range that will be available in May 2007. It uses a ceramic-coated aluminum-magnesium ribbon tweeter, honeycomb-sandwiched midrange and bass drivers, in an enclosure made of a cast anti-resonance composite material. The claim bandwidth is 28Hz–100kHz. (I could hear a small peak at 45kHz, and another one at 82kHz.) If I remember correctly—I wrote this info down but can't find it—the source was a Simaudio CD player and the amplification was courtesy Linar Audio. Adam Professional Audio is a German company that makes loudspeakers aimed at, as the name suggests, the professional market; their list of users include Abbey Road Studios and Lincoln Center. They're now poised to enter home audio. They had several of their speakers on display, but the only ones actually playing were in a large home theater demo room. The demonstration piece was the "chase" scene from the latest James Bond movie, Casino Royale, and all I can say about the sound was that it was loud. (Putting on my ultimateavmag.com hat, I can also say that the projector's color saturation was set too high.) However, reading the product literature, it's clear that the speakers represent a formidable amount of technology. The tweeter and midrange driver are based on the Air Motion Transformer principle developed by the late Oskar Heil, called Accelerated Ribbon Technology (A.R.T.) in Adam's implementation. (Klaus Heinz, Adam's chief engineer, worked with Heil.) The woofers have a honeycomb-structure diaphragm. The Adam Tensor Betas that served as the front L and R speakers use two 11" woofers and a 7" one, plus two midrange units and a tweeter. Powered with B&O ICE module. 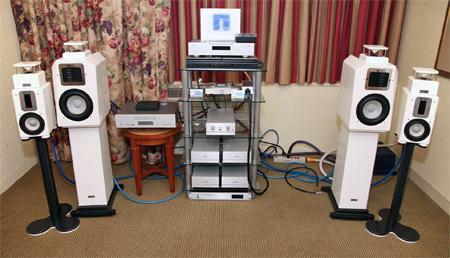 class-D amplifiers, a pair of Beta Tensors cost $60,000. There are two other speakers in the Tensor series, all semi- or fully active, the prices varying from $30k to $80k. Aurum Acoustics is one of the Canadian audio success stories. Located in Newfoundland, well away from the Toronto-Montreal technology axis, they've succeeded in breaking into the heady world of ultra-high-end audio with an unusual product: an integrated CD player/amplifier/loudspeaker combination. The price is $32,000, with extras like an isolation rack, special power cables, etc., adding another $4k or so. It's a "turnkey" system, and it works. Designer Derrick Moss has to be given a lot of credit for creating the synergy among the different components of the Aurum Acoustics system. In true audiophile fashion, he continues to tweak the system; the most recent tweaks were some internal changes in the mid/high amplifier, and the use of Crystal Cable for internal wiring. The system at FSI sounded great, particularly when playing Ray Charles' version of "Over the Rainbow." System Audio Speakers Sound "Quick"
System Audio A/S is a Danish manufacturer of loudspeakers that's been in business since 1984, but I must admit that I've never heard of it before—probably a function of the fact that North American distribution has been spotty. Listening to the new SA Rangers ($4000), I was convinced that the fault was certainly not of the speakers. The sound was open, with a wide and deep soundstage, and a great sense of "quickness." (The system used an Arcam CD source and electronics, and Nordost Valhalla speaker cables.) The SA product literature also convinced me that this is a mature, fully developed product line, with some proprietary technology, including a dome tweeter that weighs just 80mg, making it possibly the world's lightest. Pictured are S/A's sales manager Frits Dalmose (left), Canadian distributor Bruno de Lorimier (right), and the SA Ranger (middle). Antique Sound Labs' 845-triode-based AQ 1006 monoblock amplifier has been around for a while, but it has recently undergone some significant revisions, and is now in Mk.II designation. It certainly looks different than before, with a new construction that is said to provide better mechanical isolation between the transformer and the actual circuitry. Price remains at $4495/pair. I like the new cage with the concentric metal circles on top. Turntables were very much in evidence at FSI, some being on demo by their distributors, and some being used by exhibitors who just wanted people to hear what their speakers/amps/preamps sound like with a good vinyl source. Perhaps the most interesting turntable demo that was of the venerable Linn Sondek LP12, which is the turntable that I own. Linn has recently announced a series of upgrades they say make a major improvement in the sound of the LP12. Not content merely to make promises, Linn had a comparison of two versions of the LP12 and its matching arm, one that was current as of a couple of years ago, and another that had the new SE upgrades installed, both with the same cartridge, both optimally set up by Linn setup expert Gary Dilliott (who had set up my own LP12 a few years ago). I didn't have time to listen closely to the comparison, but I overheard at least one Linn owner in the room exclaim that he wouldn't have believed that such an improvement was possible. Looks like my LP12 is due for a trip to the shop. Pictured with the two Linns is Gary Dilliott. Can you tell which turntable is the upgraded version? All right, it's time to play The Price Is Right: Audiophile Edition. Take a look at the speakers in the picture. What do you think they would sell for? To help you with the bidding, I'll tell you that each speaker has a 12" Peerless bass driver, 6.5" midrange with a Kevlar cone, and a titanium-aluminum cone tweeter, all mounted in separate resin-moulded cabinets. Each speaker weights about 150 lbs and the cabinet is beautifully finished. Maybe it's my selective perception, but there seems to be a resurgence of single-driver speakers. The Gemme Audio Vivace ($4100) uses a 4" Fostex driver in a complex horn-loaded enclosure. Sensitivity is 92dB, which is not high by horn standards, but the claimed bass frequency extension is 20Hz, which is extremely low by any standard. They played some organ music at the demo, and I can't say that I heard anything close to 20Hz. The bass was impressive by single-small-driver standards, however, and the speakers had the coherence that this sort of design is known for. Gemme Audio is a small company based in Montreal, with only two products: the Vivace and the Tanto ($5100), a more conventional two-way system. Getting into the crowded audio marketplace is a difficult feat for any speaker company that doesn't have a full product range; the fact that Gemme has been picked up by distributors in the USA, the United Kingdom, France, Sweden, and Ukraine tells me that they must be doing something right. Pictured: V-P Sales and Marketing Jean-Pierre Boudreau and the Vivace, with the Tanto lurking in the background. Attending a show like FSI can be a tiring business, what with walking up and down corridors, and even when you sit down to listen you may experience tension, trying to discern the character of the sound. A few hours of that, and you can probably use a massage. If that's how you felt at FSI, the remedy was at hand: Jennifer Sunde and Mireille Beaudry are massage therapists who were at the show, offering a choice of Swedish and Shiatsu massage. Here they are in a brief break between clients. Red Wine Audio is the name of the company making amplifiers designed by one Vinnie Rossi, "an electrical engineer with a true passion for music and implementing the electronics that recreate it," whose name, if you pretend that Vinnie is spelled with one "n," means "red wine" in Italian. (Actually, "vini rossi" means "red wines," but let's not quibble.) What makes Red Wine Audio amplifiers interesting is that they're all battery-operated. The system being demoed used a pair of the Red Wine Audio Signature 70 monoblocks ($2999/pair), driving single-driver speakers ($2495 MaxHemp or $949 Super 3XRS) from Omega Speaker Systems. 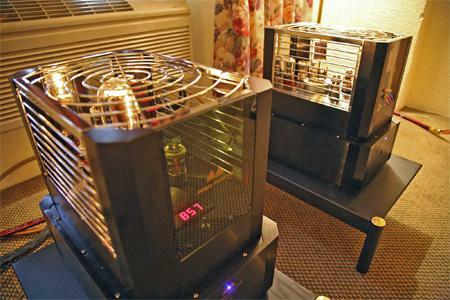 The source was a battery-powered computer server, so that the only AC-powered devices in the room were some table lamps. I can't say whether it was the battery power source or some other aspect of these designs, but the sound was uncommonly natural and easy-on-the-ears. The small Super 3XRS speaker, which uses a proprietary 4.5" Omega hemp-cone driver, had a coherence and focus that reminded me in some ways of the $7000/pair Fujitsu Ten Eclipse TD-712z single-driver speaker that I reviewed in the January, 2007 issue. 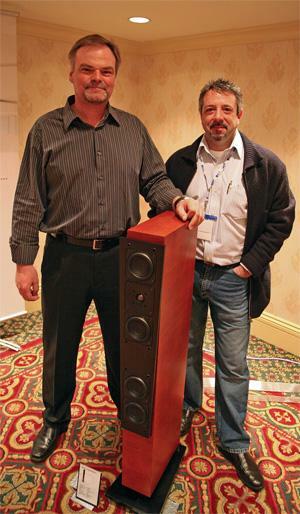 Shown here are Vinnie Rossi (left) with Omega Speaker Systems' designer Louis Chochos and the Red Wine/Omega system. 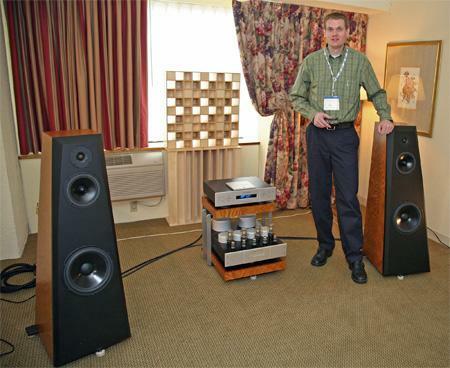 This is in the "Better Late Than Never" department: At the end of the 2007 CES, John Atkinson auditioned Sonus Faber's new Elipsa loudspeakers, but he ran out of space on his camera's memory card, so he was not able to take a picture. After the show, JA emailed the other writers that had attended CES, asking if anyone happened to take a picture of the Elipsa. None of us had. So, John, this is for you: a picture of a pair of Elipsas, which were making sweet music, driven by Ayre electronics. 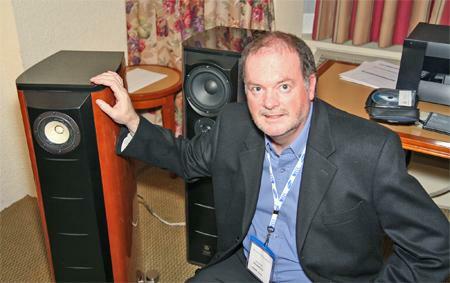 Dan Wright's career in audio started as a modifier of D/A converters and CD players. 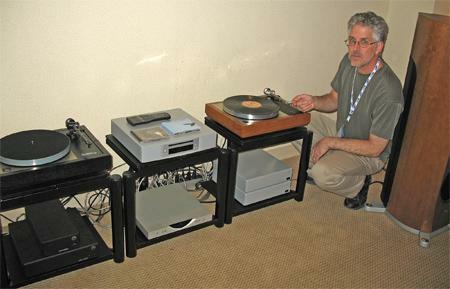 Although his company, ModWright instruments, still does digital source component modifications (he says he finds SACD players to be the best candidates for modification), he has also developed his own preamplifiers and phono stage. The latest of Dan's preamps is the LS 36.5 balanced tube line stage ($4995), which uses his own custom-designed MWI capacitors, 6H30 Russian Super Tubes, and a 5AR4 tube-rectified power supply. 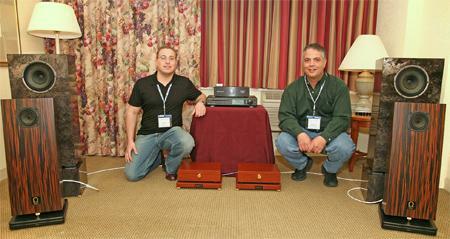 He also introduced the new SWP 9.0 SE phono stage at FSI. The advent of digital cameras has re-kindled my interest in photography, and I enjoy discuss photography in person and on some Internet forums. 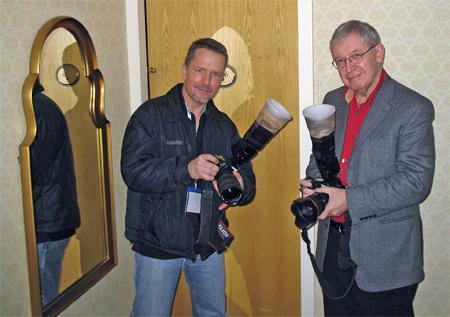 Doug Schneider of SoundStage.com (left) is another "photo guy," and one I know likes to use flash in his photography. I avoid using flash whenever I can, but I do use it sometimes; lately, I've been having more success with flash using the Gary Fong Lightsphere II, a light diffuser that bears a resemblance to something made by Tupperware. I had the Lightsphere II with me at the Show, so when I ran into Doug at FSI, I was excited about showing him this useful if strange-looking gizmo. He then took out his Lightsphere II from his camera bag, and we were ready for a "duelling Lightspheres" photo opportunity.